CARMEL, Ind. 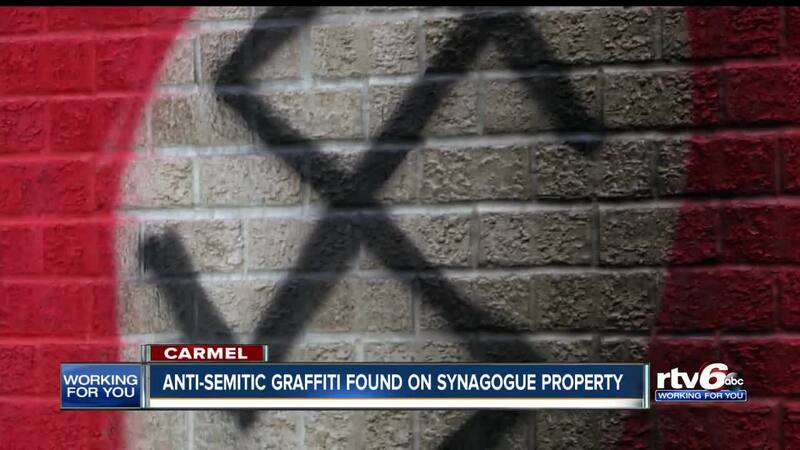 -- The FBI is working with Carmel police to investigate anti-Semitic graffiti which was discovered at a Carmel synagogue early Saturday morning. Swastikas and iron crosses were painted on a shed and garbage bins at Congregation Shaarey Tefilla in the 3000 block of W. 116th Street in Carmel. Corey Freedman, president of Congregation Shaarey Tefilla, says the vandals caught by security cameras around 11 p.m. Friday night. Freedman says the vandals were also seen on video burning something in front of the garage. It is unknown what was set on fire. The synagogue is working with other Indianapolis congregations to make sure they are aware of the incident and can take appropriate measures. An interfaith solidarity community event is planned for 6 p.m. Monday at Congregation Shaarey Tefilla. The congregation says it is comforted by the outpouring of community and interfaith support. The Indianapolis Jewish Community Relations Council says they are offering their assistance to Congregation Shaarey Tefilla. Carmel Mayor Jim Brainard says he condemns the actions of those responsible for the graffiti and will hold them responsible. "I strongly condemn the actions of those responsible for defacing a structure at the local Congregation Shaarey Tefilla in Carmel. There is no place for this kind of hatred in Carmel and it does not reflect the respectful and welcoming nature of the vast majority of our residents who come from many different cultural and faith backgrounds. As we are reminded each year during our city's Holocaust Remembrance Ceremony, we must never forget and never stop fighting against the hatred that led to the murder of 6 million Jews. These images that represent the ideas that led to those crimes are not reflective of what our City stands for. I want to assure the Congregation Shaarey Tefilla and all of our residents that our Carmel Police Department is already investigating this incident and when apprehended, those responsible will be held accountable." Several politicians have released statements condemning the vandals including Vice President Mike Pence, Sen. Todd Young, State Sen. Mike Delph, and Congresswoman Susan W. Brooks. “This morning, I contacted Indiana State Police Superintendent Doug Carter and made sure state police offered to fully assist the Carmel Police Department and the FBI in bringing those behind the repulsive acts of desecration at the Congregation Shaarey Tefilla to justice. The cowards responsible for these crimes always hide from public scrutiny precisely because they know their actions will be soundly rejected by their neighbors and are not consistent with who we are as a society. RTV6 has reached out to Carmel police by email for more information on the case. Carmel police Sgt. D.J. Schoeff says the department may have more details to release on Monday. The FBI says they are working with Carmel police on the investigation.